One of the aspects of war art that continues to surprise me is how personal it ultimately is. Any painting, however objectively representative of events it may purport to be, in it carries some measure of the artist’s subjective response to the incident, place, or person depicted. Furthermore, it is influenced by the artist’s personal circumstances and attitudes. David Young Cameron’s massive 1919 war landscape (physically and in terms of the scale of the view) Flanders from Kemmel is a case in point. It is travelling across Canada at present after display in the exhibition Witness at the Canadian War Museum in the summer of 2014. At first glance, the painting presents a misty, Impressionist-like scene. A cloud-filled sky makes up the bulk of the composition. Centring the composition is a small village. An arrangement of trees and hillside frame the wider panorama. I have always appreciated the artist’s technical proficiency in holding this wide-ranging composition together. But I never looked at it particularly closely until Canadian War Museum librarian Lara Andrews mentioned that she saw figures moving through the middle ground near the village – soldiers or refugees – she wasn’t sure. This led me to scrutinize the painting anew as a work of art and, also, to explore more fully the history behind it. The painting’s artist, David Young Cameron, was born in Glasgow on 28 June 1865, the son of the Reverend Robert Cameron, minister of Cambridge Street Church in that city. D. Y. Cameron began his career unhappily as a businessman but switched to art, studying early mornings and evenings at the Glasgow School of Art and, after 1885, full time at the Royal Scottish Academy in Edinburgh. His subsequent career as a landscape artist in the Dutch manner (but with Impressionist overtones) flourished. Honours and awards followed and, although virtually unknown today in 1920 he was elected a member of the Royal Academyand knighted in 1924. Alongside professional responsibilities that included trusteeship of the Tate Gallery in London, he devoted much time and money to renovating and refurnishing his neighbourhood parish church in Kippen. Cameron died in 1945 shortly after preaching in St. John’s Kirk in Perth, which he had also been decorating. Like so many artists of the time, two First World War commissions from Britain and Canada consolidated his career. The first was with the Canadian War Memorials Fund, the Canadian official war art program. Correspondence held by the Imperial War Museum indicates that Cameron held the rank of major in the Canadian Army and that he was commissioned to complete two paintings in 1917. The experience seems to have been trying. “[I] am rather fed up with Canadians, their officers, officials, & mistakes,” he moaned later in 1919 to Alfred Yockney of the British Ministry of Information. Yockney, in the wake of the Canadian commission, was seeking to employ Cameron to create a painting (in which he succeeded) for that country’s ultimately never realized war memorial art gallery. Ironically, Cameron’s painting of the post-war snowy devastated Ypres salient for the British is remarkably similar to his second Canadian work, perhaps completed prior to the British version. Cameron also completed a number of independent works of war art. By 1920, his official war compositions were completed and he exchanged painting war for membership of the Royal Scottish Academy’s Scottish War Memorials Sub-Advisory Committee. So what of Flanders from Kemmel? In Percy Godenrath’s 1934 publication Lest We Forget in which it is reproduced, it is described as follows. 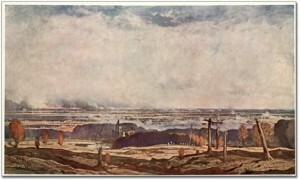 This painting gives a general impression of the far-reaching and somewhat featureless plains of Flanders rising to the ridges where fighting was fiercest. It is not a picture from one point of view but built up from many notes around Kemmel. At such a distance the desolation and devastation of war are not manifest but the smoke of batteries and here and there the flame of fire reveal a land ill at ease. In the foreground are shattered trees, their stricken forms relieved against the mists of autumn which rise and fall among the woods. The sketches were made during the Passchendaele operation. But there is considerably more to this composition than this description affords. Content is visible that directly references biblical stories. There is no written evidence of this content in Cameron’s own hand. Nor do other writers make any reference to it. It is the picture’s own iconography that suggests this and our knowledge of Cameron’s own faith that underscores this reading. If we begin by looking at the foreground, we see a group of three trees towards the right; one in the shape of a cross, and the other bearing a shape that could be interpreted as a hanging figure. The resemblance to images of Christ’s crucifixion at Golgotha is underlined by the three crosses set apart a little further to the left. In a wartime context that equated Christ’s sacrifice with that of the soldier, this painting becomes less about the landscape of war and more about wartime killing being a necessary evil in pursuit of a better world. Pursuing this interpretation in the balance of the painting, we see, as Godenrath described, a distant but extensive landscape of smoke and flame, or perhaps as Cameron might have viewed it, hell on earth. It must be recalled, first, that the autumn 1917 Battle of Passchendaele was awful in its length, destruction, and misery. Second, the only wartime sketching Cameron did was during this battle as Godenrath notes, and it is simply inconceivable that its tragedies would not have made an impression. What else might Cameron have seen during his few weeks’ sketching in France, and how might these elements have been incorporated into his painting? To date no sketches have surfaced that might shed light on this question so it is only the painting that can offer clues. The village he depicts in the centre of his composition is in ruins, the church steeple, for example, showing gaping holes. Such sights would have been common in the area. Ypres, for example, was completely ruined by this time. Finally, what did Lara Andrews see in the middle of the painting? Definitely a procession of some kind: a line of figures and equipment stretches across almost the entire width of the canvas and passing the church. It is tempting to consider these figures as the damned, a staple of religious art concerning hell, which would be appropriate in a landscape of the sort Cameron depicted. Less imaginatively, the figures could be a combination of refugees fleeing the battlefield and their homes and endless columns of soldiers leaving and returning to the battlefield with supplies and the wounded. What exactly is going on, we shall never know. But we can read this figurative element as a rare painted commentary on the immense human suffering that marked the Great War from which neither soldier nor civilian entirely escaped. In this context, is it surprising that Cameron, a declared Christian, incorporated the biblical events on Golgotha into his painting perhaps in the hopes of hinting at something redemptory in the human misery and suffering he witnessed? To have not done so would have been to deny the faith that clearly governed his life. In Flanders from Kemmel we see how strongly personal subjectivities colour interpretations of war. We also learn that, in an increasingly secular age, the biblical content that Cameron seemingly wove into his interpretation of the Flanders battlefield was not discerned in any published way leaving this work, like so much of his peacetime work, dismissed as competent landscape. Looked at from a new perspective, Cameron’s personal, subtle, and arguably propagandist elements in Flanders from Kemmel, in fact turn this landscape into a commentary on the righteousness of war, however harrowing he might have found it. Laura Brandon was the Curator of War Art at the Canadian War Museum from 1992 to 2015. She taught at Carlton University and has published a number of books, including Art or Memorial? The Forgotten History of Canada’s War Art (Calgary: University of Calgary Press, 2006). Find her at http://www.laurabrandon.ca/. Witness will appear at the Beaverbrook Art Gallery, Fredericton, 17 September to 15 January 2017; Arras, France, March to July 2017; the Judith and Norman Alix Art Gallery, Sarnia, 4 September 2017 to 7 January 2018; and the Varley Art Gallery, Markham, 15 September 2018 to 6 January 2019. It was at the Canadian War Museum from 10 April to 26 September 2014 and at The Rooms, St. John’s, 18 September to 10 January 2016. D. Y. Cameron to A. Yockney, 27 March 1918, Imperial War Museum, Art Department archive, Cameron, D. Y.